Patriarch Irinej, along with 12 bishops, on Tuesday served liturgy in Belgrade, marking the start of the regular spring session of the Holy Assembly of Bishops. The gathering is set to last for several days. Irinej said a prayer for a successful gathering of the Church’s top legislative body, for the well-being of the Church and the people who faced serious challenges. In his sermon at the end of today’s liturgy, the patriarch stated that Kosovo and Metohija will remain Serbian. He also prayed for God to save Kosovo and Metohija where Serb Orthodox holy places, “covered with blood of our holy martyrs,” are located. “As long as our love and thoughts are connected to Kosovo and Metohija, it will remain ours, as it has been before,” the head of the Serbian Orthodox Church said in his message. Among the 12 bishops who served liturgy today were Amfilohije, and Teodosije, of the Raška-Prizren Diocese. Despite various announcements about its agenda, “nothing spectacular” should be expected in the first few days of the assembly, considering the gathering will deal with the issues of the Church, the Tanjug news agency was told at thePatriarchy in Belgrade. 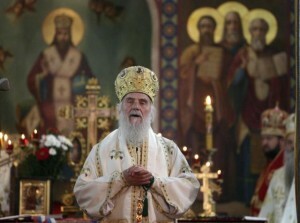 It is certain, however, that the agenda will not include an initiative of the clergy from several dioceses, who, offended by the recent statements made by Prime Minister Ivica Dačić at the expense of the Serbian Orthodox Church (SPC), are asking for him and his associates to be stripped of the decorations and awards they had been given by the Church. According to the Church procedures the initiative will be submitted to the bishops, and they will then forward it to the Holy Synod. Sources from the Patriarchy also told Tanjug that the issues that most interested the media, such as the so-called Kačavenda case, the addresses of Metropolitan Amfilohihe and retired Bishop Atanasije during a recent rally in Belgrade against the Brussels agreement, and the filling of the vacancies for bishop in various dioceses, will be on the agenda in the last days of the regular May assembly. Metropolitan Amfilohije will submit an official initiative for Bishop Petar II Petrović Njegoš to be declared a saint, given that Montenegro’s 19th century religious dignitary and political leader has already been beatified at the level the SPC’s Diocese of Montenegro and the Littoral. The issue of the property and the status of the Serbian Orthodox Church in Kosovo after the initialing of the Brussels agreement could also find its way to the agenda, as well as the marking of 1,700 years of the Edict of Milan, the Church’s stance toward the unrecognized Macedonian Church, and the problems in the operation of certain dioceses. Since this meeting comes just a few months ahead of the start of the marking of the 17 centuries of the Edict of Milan, to be held in Niš, southern Serbia, is expected to be one of the main topics of the Church assembly. Editor of Religious Information Agency Živica Tucić commented on the gathering to say that it is not expected to produce “fateful decisions” but that it will certainly discuss Kosovo, relations between the Church and the state, as well as the affairs of the SPC. According to him, the Church wants to put an end to the statements and actions of some bishops and avoid further tensions in relations with the state. “It is somehow not in the spirit of Orthodoxy that the Church has a conflict with the state. I think that Patriarch Irinej repeatedly stressed ahead of the assembly that fair relations should exist between the Church and the state – that is, if there is no harmony, that words and actions that can irritate one side or the other should be avoided,” said Tucić . “The opportunity should not be lost to provide some resolution on that…I think the Church this time around will react and it will not move these issues to the next assembly,” Tucić told the Beta news agency.